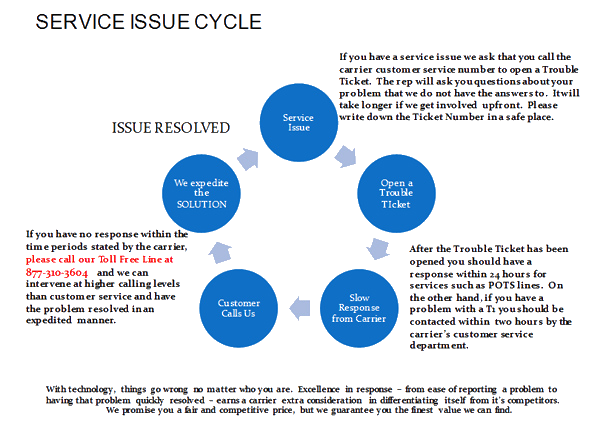 If you have a service issue we ask that you CALL THE CARRIER CUSTOMER SERVICE NUMBER and open a Trouble Ticket. You will be contacting the lowest service level at that point but the tech rep will ask you questions about your problem that we do not have the answers to. This will save lots of time in the resolution of your issue. After the Trouble Ticket has been opened you should have a response within 24 hours for standard services such as POTS lines. If you have a problem with a T1, you should be contacted within two hours by the carrier’s customer service department.